This website is a collection of items that interest me. I’m sure you’ll find something to enjoy. Look at the items on the left, but also check out those below. Like most people I have opinions on pretty much everything and I like to share them. This blog is the place to read what I think about life, the universe and everything. The topics will be completely eclectic and cover whatever is engaging me when I find myself moved to write. Enjoy. And if you’d like to join in, I’ve enabled comments but I don’t know if they work yet. Or you could drop me a line using the contact form. Drop me a line using this contact page. This is my blog. A collection of thoughts from one such as I. Have you noticed that a new charge is being added to your bill in most restaurants when you eat out? They call it a “service charge”. In order for the restaurant to provide a waiter to come to your table and take orders and serve your food, they will add a fee. They don’t even pretend it’s a gratuity for the staff. They brazenly name it for what it is - and it’s usually a massive 12.5%. Admittedly, they do forewarn you, in rather small type, at the very end of the menu, that “an optional (or discretionary) 12.5%” will be added to your bill. But it seems strange to me - what if John Lewis added 12.5% at till every time you shopped? Or M&S? When utility companies put their prices up by 8 or 9%, there's a public outcry, but when restaurants add 12.5% few people seem to care. Are we all so rich that we don’t care? Or are we so British that we would be far too embarrassed to say 'no' in a restaurant, but we don’t mind marching in protest about utility companies? It has always been a problem and, since the arrival of digial technologies, it has become very much worse. When I was young, cameras used roll film and you got eight shots on a reel, which you had to send away to be processed and printed. As a result, people had relatively few, they were very small (contact prints) until enlargements became available, and they were also black-and-white until the 1960s. Later, 35mm film had 25 or 36 pictures on a roll (what luxury) and they were all colour prints (if we ignore the brief period in the early days of colour when slides became popular). During this period, if you didn’t make photo albums, you ended up with carrier bags full of Boots packets (I have many in my loft). Since the arrival of digital cameras and mobile phones, we all have thousands of digital images on our hard drives, and they’re as impossible to view as the carrier bags were. 1. pick the best from each batch and delete the rest. I have a friend who always does this so he has a selected manageable set of photos of each event he attends. I don’t so I have thousands of photos. 2. At the very least, put each batch of photos, as you upload them, into a folder on your hard drive. I used to try to do this. I use Aperture, which is Apple . . and also discontinued by Apple, so it will soon stop working. Then I’ll be stuck again. I have 86,000+ photos, many of which are in named folders within Aperture! Free alternatives used to be iPhoto (Apple), Picasa (Google) plus others. Not sure what the most used Microsoft one was. The idea is that as you upload your photos, your computer looks at them and sorts them for you - by year, by place, by face recognition, etc., etc. Apple’s offering is “Photos”. Google’s is “Google Photos”. Again, I’m not sure about Microsoft. The idea is that you can look at your photos and home in on useful collections (albums made for you) and you can make your own albums. You can also search. So, if you type “bristol” in the search box, it should show you all the photos taken in Bristol. You get the idea. “Dog” will show you all the dogs. Picasa has been replaced by Google Photos. It’s online so you don’t install a program. According to Google, your Picasa photos are already there waiting for you. You can set it to automatically upload all new photos as you transfer them to your computer. Cars have always been expensive purchases but now there's an extra factor to buy into (or not) - safety technologies. These are the driverless technologies which will one day give us fully autonomous cars They're being introduced to new cars right now. They don’t replace the driver; they make driving safer. There are calls to make it compulsory on all new cars because it would save injuries and insurance premiums if every new car had it fitted as standard. But as usual, these technologies are being implemented slowly, and they are usually optional (and expensive) extras, so most cars still don’t have them. But now they've been invented, it seems very unwise to buy a car that doesn’t have them. So, needless to say, I want them all! We see them on the news. Hundreds of illegal, would-be immigrants trying to get to Britain’s bountiful shores. 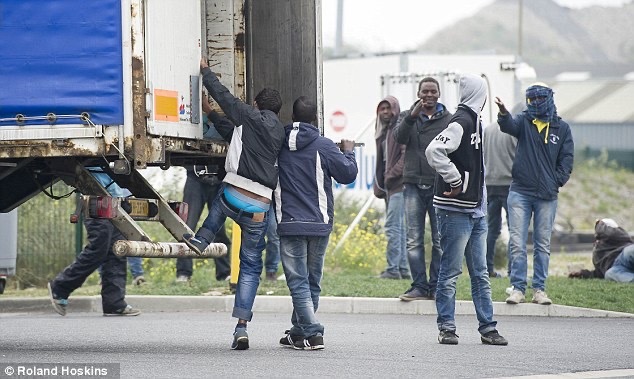 In 2015 they filled the camp at Calais known as “The Jungle”. We saw them as we left Calais on our journey by coach to Boulogne-sur-Mer with a party of people from Stilton’s Twinning Association. They were running about on the the road leading to the channel ports and tunnel. We were travelling the other way. As residents of a small island off the coast of mainland Europe, we tend to feel threatened. People say: “We’re already overcrowded.” and “We can’t take endless numbers of strangers into our tiny island.” and “They only want our benefits, housing and a car”. It’s a worrying situation and, reading the newspapers makes it feel more like an invasion than a crisis. But what happens when you meet one of these illegals face-to-face? It happened to us on our return from a coach trip to Boulogne in July in 2015. King Richard I, ‘The Lionheart’, died in April 1199 when he received a crossbow bolt wound to his left shoulder whilst walking the castle walls without his chainmail. It wasn't a bad wound and these days we'd clean it and dress it and put him on a course of antibiotics. He'd have been as right as rain in no time. But Richard died in his mother’s arms ten days later. The warrior king, seen here in the famous statue outside the Houses of Parliament in London, was brought down by microscopic organisms that we barely give a second thought to. Richard's wound allowed bacteria through the skin's protective layer, and once inside they multiplied until infection raged through his body, causing fever and gangrene and ultimately killing him. His fate was not unusual. Before the discovery of penicillin, any wound could lead to infection, fever and death. Not all wounds did, of course, but the possibility was always there. Even a minor scratch could lead to death if you were unlucky.